This cap was originally intended for a 9 year old, but its turned out too small for her. This one will fit a 1 to 3 year old, so I will make another one that is larger. My friend knows a 9 year old girl who is loosing her hair due to chemotherapy. Just imagine being 9 and having to go through that. I’m hoping to make her a nice cap, I chose this yarn because it’s nice and soft with a silky feel. She would need an especially soft yarn, and because its still summer and quite hot, I don’t want to make anything too warm. I’m not sure what the blend is but my guess is that it’s acrylic. I started this on Thursday afternoon and finished it on Friday, using a 4mm hook. There are 6 increasing rows, then the non-increasing rounds have a pretty lacey pattern. The pattern is 2 ch sk 1, 3 dc, sk 1 (1 dc, sk 1, 3 dc, sk 1) repeated to end, sl st. I thought it would be big enough but I had nearly finished when I realised it would only fit a small child, not a 9 year old, after checking a site that lists head sizes for crochet hats. 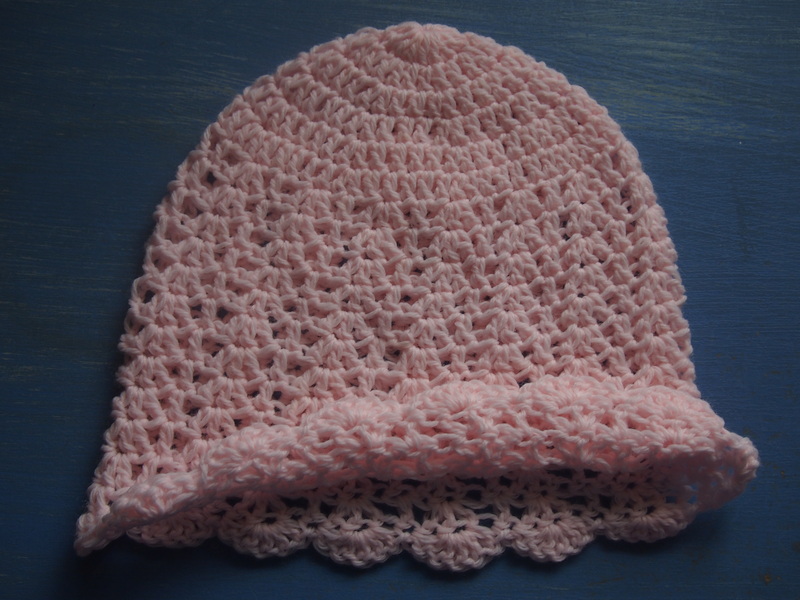 But I finished the hat anyway, because I know some 1 year old girls. Maybe one of them would like it?